Business leaders need to start looking at how to use AI, machine learning, natural language processing (NLP) and chatbots, to enhance conversational engagement and rich interactions. I have spoken to business leaders and enterprise representatives from companies all over the world, and the general theme or concern has been, how can we improve productivity and positively impact both employee and customer experiences? At the heart of workplace productivity and user experience are conversations and a dynamic conversational flow that drives and weaves together work processes and workflows. Enabling those conversations, while keeping context is the key to workplace productivity. This is the experience layer that runs seamlessly through both internal and external facing work processes, where customers are then involved. It’s a lifecycle and a continuum with dynamic ebbs and flows. While a lot of us in tech circles do get caught up on the latest hype around AI, machine learning, chatbots and all the latest flavors, our hearts are generally in the right place, with the centering idea that, it’s really about improving people’s experiences. We just tend to “geek out” and run off on tangents a lot! Who can blame us, we are living in exciting times my friends! But I digress. We do have to center on improving workplace productivity and helping people get their jobs done efficiently. Our work lives are built upon a dynamic flow of endless interactions that are woven together via conversations. These interactions breed follow on interactions and require critical business decision making along the way. I’ve said previously that conversations happen throughout the lifecycle of a business process and is critical to its efficiency and ultimate successful outcome. Increasingly, those conversations include people, machines, chatbots and other applications. They happen in person and virtually, with a mix of environments and devices, including conference rooms and shared open spaces. Enterprise investments will surely then have to focus on the entirety of all the moving parts that need to converse with each other. Those investments not only include technology, but also fostering a culture of collaboration within the workplace. Each line of business, whether it be sales, marketing, Human Resources (HR) or support, must place keen focus on improving the interaction and conversation flow of the people involved in their respective workflows and processes. It is from this perspective, where business planners from IT and all lines of business, have to start when looking specifically at how to implement AI, machine learning, natural language processing (NLP) and chatbots, to enhance conversational engagement and rich interactions. Business planners have to think through the individual, all the way to the team productivity scenarios. Our individual work days are filled with tasks that need to be completed. Some of these tasks are mundane and could definitely use some automation to take things off our plates to concentrate on other critical matters. One of the key promises of AI is the ability to foster task automation. 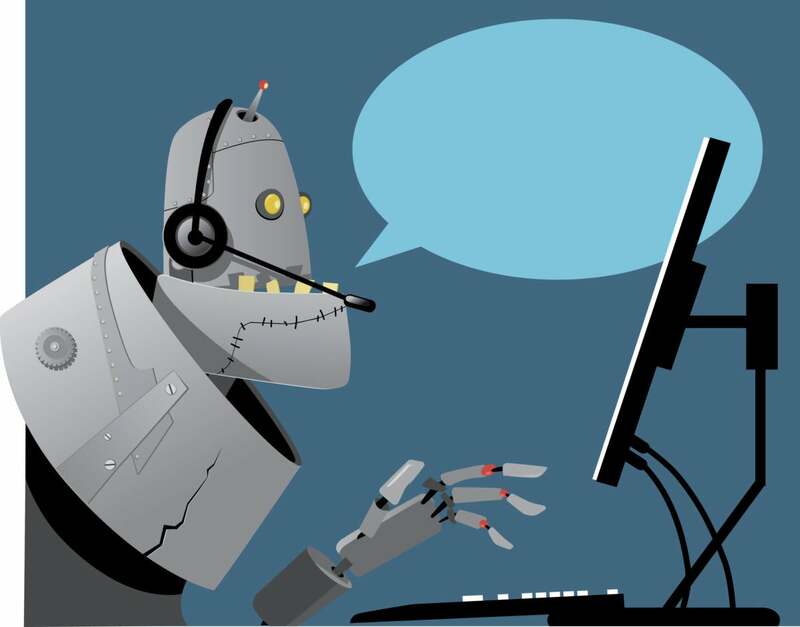 Software, smart machines and chatbots can automate or augment – and optimize – an increasing number of repetitive tasks within a business-process workflow. Task automation that leverages filtering and prioritizing algorithms will be an initial broad use case within enterprises. Applying AI to productivity apps like email or messaging, brings intelligence to make your inbox smarter with analytics about your work habits, contacts and calendar. The learning algorithms get smarter over time about how you work and how you collaborate with your contacts. Machine learning algorithms can help users tag and prioritize actions and build decision trees and process loops that model segments of the business process. Your collaboration and workplace productivity tools essentially become “smart” about how and with whom you work. The ideal is that they “know” what you’re doing and what the desired outcome is. Interfacing with virtual assistants, powered by said algorithms, can potentially automate the tasks around scheduling meetings, coordinating with contacts and surfacing the required files in context for better conversational engagement and collaboration, which can lead to better business decisions. For example, I recently attended Cisco’s Advanced Technology Fair in San Francisco, where they demo’d The Cisco Spark Assistant for automating meeting tasks, scheduling, set up and calling contacts. Cisco Spark Assistant is the new voice controlled interface for what they refer to as simplifying the meeting experience. The AI technology behind it is from the recent acquisition of MindMeld, the conversational AI company. Interacting in natural language fostered easier and faster meeting set up. Overtime the expectation is the system will learn more about you and further automate the process. Let’s take examples from another recent event I attended, Salesforce’s annual Dreamforce 2017 conference. Salesforce demo’d Einstein, its AI engine, that can bring intelligence to sales, marketing, services and commerce workflows. For example, Einstein can retrieve insight from your data to help you focus on the leads and opportunities that you can convert. This focuses sales efforts, interactions and conversations in a targeted way on customers to improve individual and sales team productivity. It can help to anticipate customer issues from a services perspective. It can also help marketing professionals to focus on who wants to engage and in which channels. All these processes require coordination, communication and insights from data that then enrich internal and external interactions and conversations. For creative professionals, Adobe demo’d its Adobe Sensei AI platform at its recent Adobe MAX conference that aims to bring intelligence and creativity to photography, video, illustration and design workflows. The AI becomes a partner in the creative process to improve productivity of the individual and entire creative team. It can automatically search for relevant images Sensei has tagged and respond to voice prompts. There is a sea change happening as I speak to business users of technology and technology providers themselves of all sizes. In addition to the examples cited previously, at every tech conference I’ve attended this year, AI is front and center. At Zoomtopia 2017, Zoom’s first user conference, they announced enhancements to its meeting solution, which included augmented reality meetings and automated intelligent transcripts, as well as integrations into Slack and Workplace by Facebook. Using AI for automating meeting transcripts eliminates the need for note takers and creates a searchable transcript. It converts speech to text and identifies each associated speaker. At RingCentral’s ConnectCentral event, they announced the RingCentral Connect Platform will have new bot and AI integrations with Amazon, Google and Slack. It’s Glip conversational workspace offering, will have deeper integrations for AI and chatbot enhancements for process automation to enable more seamless workflows like in sales and support. I deliberately started this from the perspective of improving workplace productivity, with a focus on conversational experiences, and then backed into AI as a way to get it done. I want us as business planners and those responsible for critical business workflows to understand that productivity improvements come from focusing on improving people’s experiences, which is inextricably linked to their interactions and conversations. The more intelligence we can bring to that, in making it seamless, the more productivity enhancements we will achieve. So, pay attention to the examples I mentioned previously, with a people-centric lens of where you can begin to improve the employee’s experience and in conjunction the customer’s experience. I believe future advancements in AI will take it beyond just simple automation and will bring us even newer ways of working and doing things that will take workplace productivity to a whole other dimension.